The Key is latest and, also, possibly the last installment of Baron Fig’s Squire subscription service. 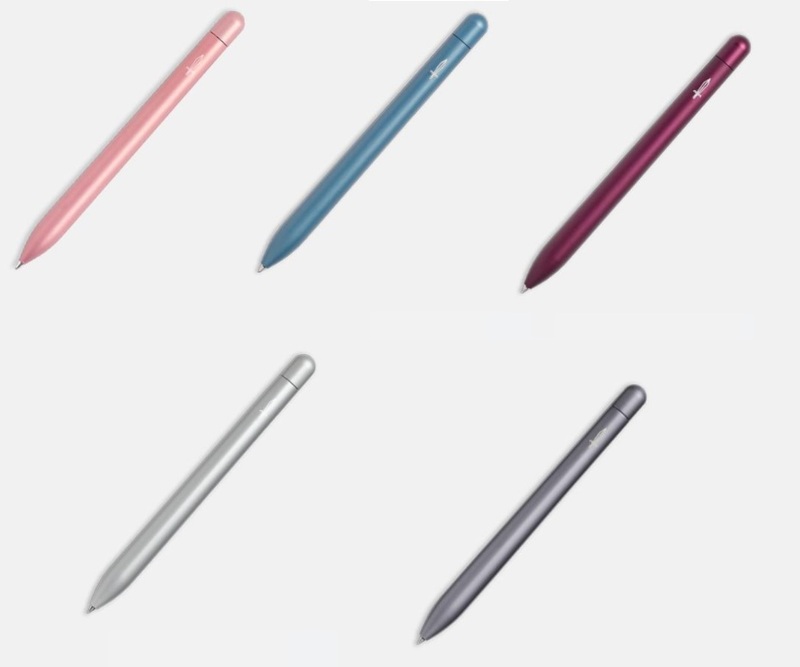 Rumor has it that the company will continue making special edition Squire pens – they’ve already produced a bunch of new colors – but without the pressure of meeting a quarterly deadline. The Key, in fact, should have been released in Q4 of 2017, but it wasn’t shipped until early January 2018. I’m inclined to overlook the delay, however, because they managed to put out a pretty good edition this time ’round. After my disappointment with The Insightful Spectre Squire, an edition that boiled down to a paint job with mildly interesting marketing, I am very happy to see that Baron Fig has attempted something new. Instead of the body being made from the Squire’s standard aluminum, The Key is entirely made of brass. This change is immediately noticeable, as it’s easily twice as heavy as the other Squires I own. 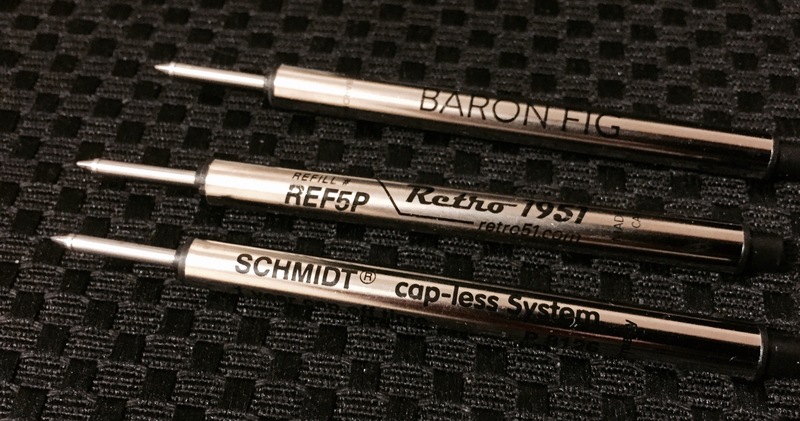 It comes with Baron Fig’s standard 0.6mm refill (a rebranded Schmidt), but the refill included with mine was a dud. This happens occasionally with these refills, but it was no problem for me because I have plenty of extras. 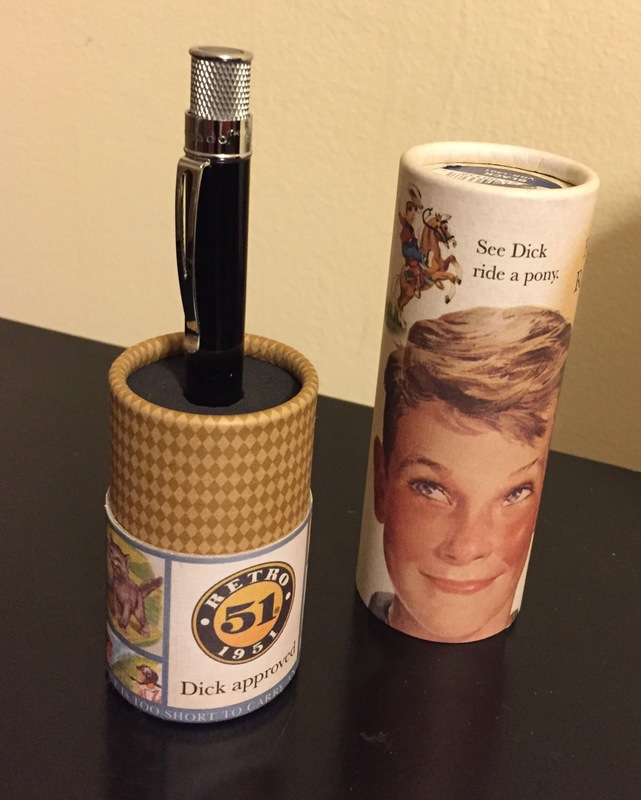 It is the same style refill used in the Retro 51 Tornado, after all, and I have a ton of those. Overall, the pen looks minimalistic and sleek, it has a good (bottom-heavy) balance for being so heavy, and pairing it with the company’s new Lock notebook was a good marketing move. My one complaint, as always, is that this pen likes to roll away, perhaps even more so than the other Squires I own. On multiple occasions I’ve jumped at the loud “thunk” The Key produces when it falls off my desk and hits the floor. Luckily there has been no noticeable damage (to either the pen or the floor). If Baron Fig keeps releasing these limited-edition Squires, I can’t say for certain whether or not I would purchase them. There have been ups and downs with this subscription service, after all. So, for the moment, I’m content to take a “wait and see” approach. Well, that didn’t last long. On June 27, roughly a month after releasing the second limited edition squire, Baron Fig abruptly announced an intention to end their subscription service. 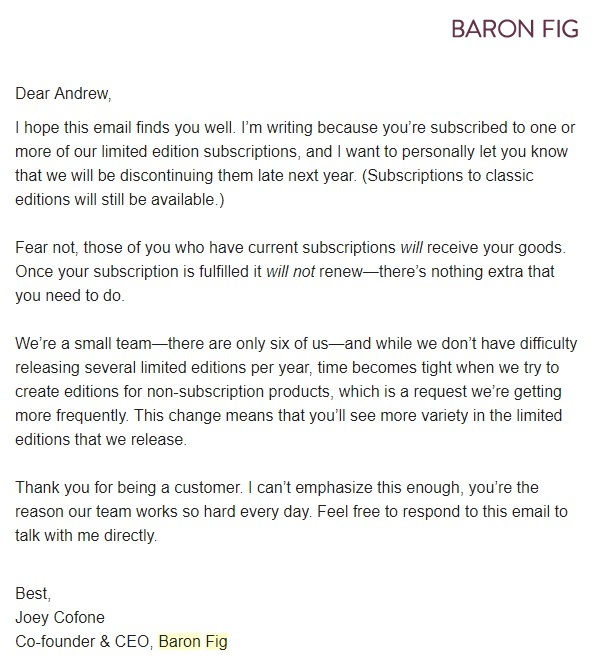 In an email sent to subscribers, the company’s co-founder Joey Cofone stated that the subscription service will cease at the end of 2018. However, my subscription ends at the end of 2017, and, as far as I can tell, there is no way to renew it. Maybe that’s all for the best. I like this third edition in their series, named The Insightful Spectre Squire, but there’s really nothing new here. It has a dark gray (“phantom black”) body along with an etching of a little ghost on the barrel. Other than that, it has the same size, shape, and refill as the standard Squire, which just makes this edition a bit boring. If it’s Baron Fig’s intent to retain the overall design of the Squire while only making aesthetic adjustments, I’m not opposed to it. That is essentially what Retro 51 does, and I love that company’s pens. But with this Insightful Spectre edition, all I can think is that I already have a black Squire and had a charcoal gray Squire (before I lost it), so why would I want another one that looks so similar? 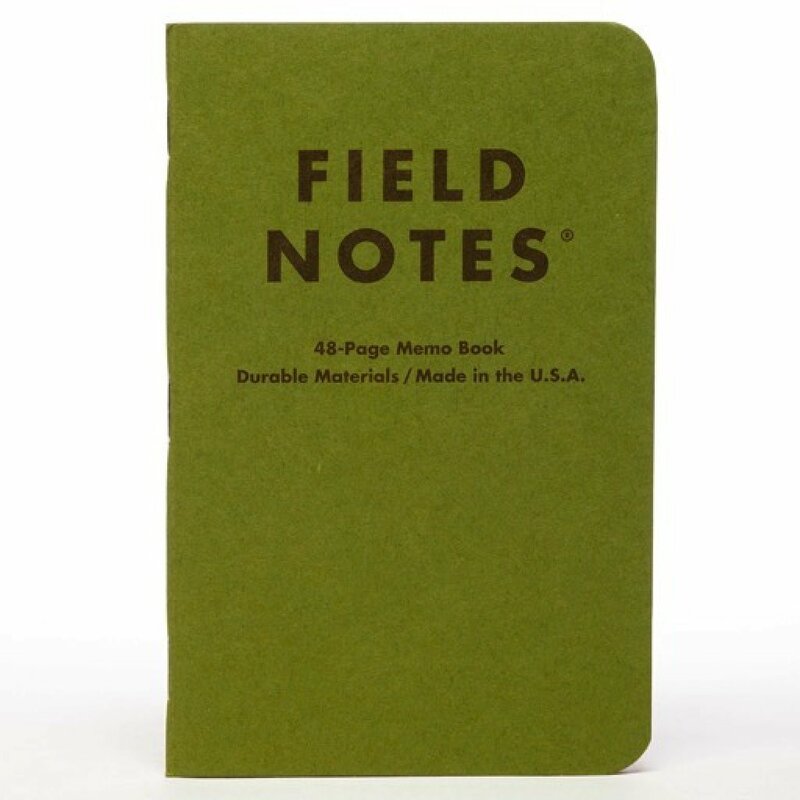 At least the Experiment edition, the second in Baron Fig’s subscription series, had a bright color and ink to match. To put it bluntly: if you already have a Squire, there’s no need for this one. I’d like to see Baron Fig try something a little different and take a risk. Something simple like adding a knurled grip or flat edge would be great. Even doing a full-barrel design, rather than a tiny icon, could go a long way. Baron Fig has a lot of talent and creativity (just take a look at the great copy written for this Squire edition), but with the Squire subscription service ending, I don’t hold out a lot of hope for the final installment(s). Experiment No. 108 is the second offering from Baron Fig in their quarterly Squire pen subscription series. Besides making for a confusing blog post title (see above), this ‘Experiment Squire’ is meant to conjure up images of a laboratory. It has a emerald-green barrel, reminiscent of Flubber, and the original Squire’s sword logo has been replaced with a bubbling, round-bottom flask. The overall construction of this Squire hasn’t changed, but smaller, incremental changes are starting to pile up. Besides the body color and the logo (which first changed in the Alphabet Squire), Baron Fig decided to include green ink with this pen. It was an easy change to make, as Schmidt – their supplier – already creates a 0.6mm green refill, but it’s still a nice touch. And when I eventually get tired of the green ink, it wont be a big deal to swap it out. Because the Experiment Squire isn’t significantly different from previous versions, there’s no big reason to throw your money at this pen. That is, of course, with the exception of the green barrel, which I love. And based on the fact that this pen is already listed as ‘sold out’ on the Baron Fig website, I’m probably not alone in this feeling. Though this is only the second in the Squire subscription series, it seems to be going well so far. I remain excited to see what Baron Fig comes up with next, which probably says a lot. Although, I have to admit that I’m still hoping that the next version has some sort of clip. Late last year, the guys at Baron Fig announced three new subscription services; one for their Confidant notebooks, one for their Archer pencils, and one for their Squire pens. I already have too many notebooks, and I don’t really use pencils. But the Squire pen subscription – that is something I was interested in, especially after my original Squire, from Baron Fig’s Kickstarter campaign, was lost. So I purchased the subscription, and the first of four quarterly edition Squires arrived at my doorstep earlier this week. With this first limited edition, called “Alphabet,” Baron Fig played it pretty safe. There is very little I can say here that I didn’t already write in my review for the original Squire – it’s identical in regards to size, shape, refill, construction, and twist mechanism. The big difference is that this edition has a matte black body, whereas previous color options were silver and charcoal. And in place of the Squire sword logo, this edition has the 26 characters of the English alphabet printed vertically down the pen’s barrel. Besides that, the packaging has also been updated from a square box to a rounded one (a close resemblance to the current Retro 51 Tornado packaging), and the twist retracting mechanism seems a bit smoother. Although the ‘alphabet’ theme seems superfluous, I do think it makes sense for the very first pen in the Squire subscription-series to be fairly standard. Frankly, I’d have been just as happy with an all-black “stealth” edition. Still, I wouldn’t mind something a little more exciting next time, such as a bright color or (dare I suggest?) a pocket clip. But whatever Baron Fig ends up doing with the second Squire in this subscription-series, I suppose it’s a good sign that I’m looking forward to finding out.